I love how Rachael Ray takes a basic dish and puts a little twist on it. She does exactly that with her Jambasta recipe from the February/March edition of Every Day with Rachael Ray. The picture at left is from the magazine - I wish mine looked that good! 1. Bring a large pot of water to a boil. Add salt, then add the pasta, cook until al dente and drain. 2. While the pasta works, heat a large, deep skillet over medium-high heat. Add the EVOO, 2 turns of the pan, and the sausage and brown for about 4 minutes to render the fat and crisp the sausage. Transfer the sausage to a plate with a slotted spoon. Add the butter, garlic, chile, bell pepper, celery and onion to the skillet and cook for 5 minutes. Season with salt and pepper, add the flour and cook for 2 minutes, then whisk in the beer and cook until it evaporates[make sure it really has all evaporated], about 2 minutes. Add the broth, tomatoes, hot sauce and thyme. Bring the liquid to a bubble and stir in the chicken and shrimp. Cover and cook for 7 minutes, until the chicken is cooked and the shrimp are opaque and firm. Stir in the cream and add the pasta. Ladle up the jambasta and top with the scallions and the reserved crispy andouille sausage. This is so good! I made it last night and just ate some leftovers for lunch. 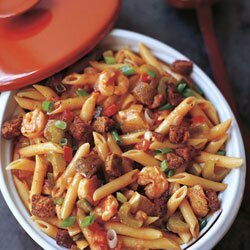 Better than regular jambalaya-pasta stands up to flavors better than rice. I completely agree that the pasta works so well with it that I kept thinking, "why hasn't anyone thought of this before." Man, it was good. I saw the rerun on Food Network last week and had to try it. I LOVE it. My whole family did. I will definitely add this to my favorites.